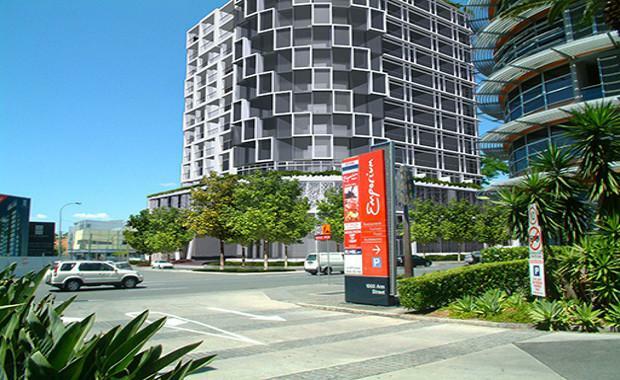 Kenlynn Projects Pty Ltd has submitted a proposal for a 15 storey multi-use tower on 949 Ann St in Brisbane’s Fortitude Valley. The plan is for 42 residential apartments, a 70 room hotel with function and meeting rooms, 98 car parks, a café, and 862 square metres of office or retail ‘showroom’ space. The development will include a gym, pool and deck on the top floor. The 1525 square metre site for Lawrence Hotel and residences is located on the corner of Ann and Chester Streets, opposite the Emporium Hotel, retail, and residential development. The Kenlynn’s group other current projects include Sydney on Sydney in Brisbane’s New Farm. The 57 apartment project, located in one of the fasted growing areas in Brisbane, was designed by Brisbane based Noel Robinson Architects. The Queensland based Kenlynn Group specialises in Brisbane based multi-use hotels and is involved with the residential Adnama Apartments in Teneriffe as well as the Novotel Brisbane Airport Hotel and the New Inchcolm Hotel and Suites. The proposal is currently being assessed.